The Hamelin Pool Telegraph Station was built in 1884. An important link in the telegraph line between Perth and Roebourne it was originally named the Flint Cliff Telegraph Station after a local landmark. The station played a vital role in Western Australia’s communication system until the public telex system spelled its demise in the late 1950’s. Also known as Flagpole Landing in the early 1900’s, Hamelin Pool was the landing point for cargo vessels bringing supplies to, and shipping wool from, surrounding stations when there were no roads. 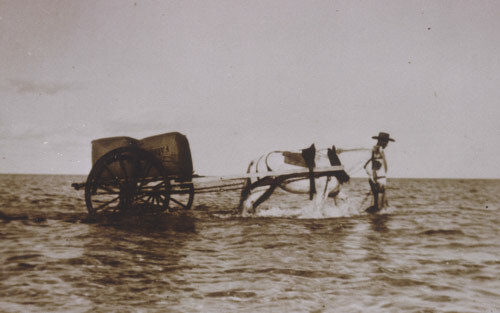 Wool was hauled by horse and cart to small vessels close to shore for transport to larger vessels in deeper water.